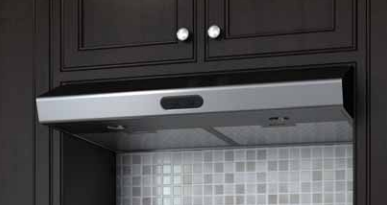 Proper ventilation is very important in a new home, especially if you like to cook. You do not want lingering odors in your home and grease in your kitchen. At the same time, Massachusetts has new make-up air laws, so you want your new vent to pass inspection. 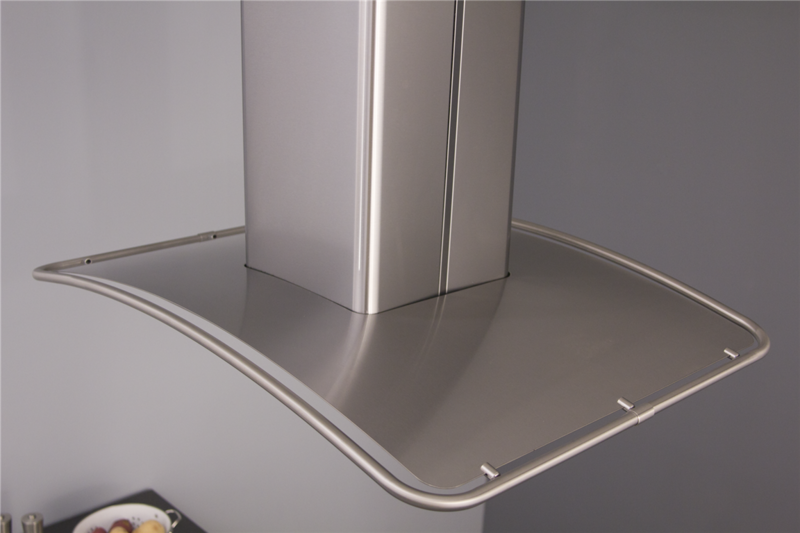 We have developed an attractive new line of hoods with good power to remove odors, new baffle filters to remove more grease, and are compatible with Massachusetts make-up air laws. You can watch the video or go directly to the hoods below. 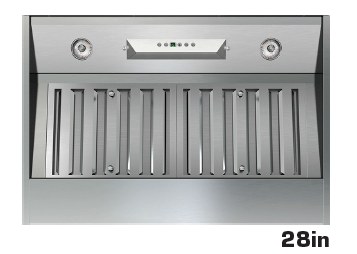 Professional hoods are used for maximum CFM for professional ranges or if you like to wok or stir fry. 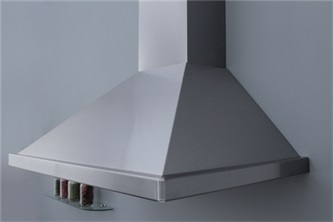 Decorative (also known as chimney hoods) are focal points in your kitchen. 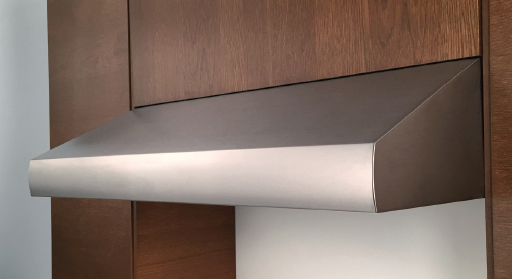 Hood inserts allow you to use your own customized wood cabinets instead of steel. Under cabinet is the more basic hood to go over most regular ranges. Why do we have our own line of hoods? We wanted to provide the latest technology, better venting solutions, and style at a lower price. Massachusetts also has some unique venting regulations so there had to be a compatible hood line to pass inspections. So let us address each point and then show some of the more popular hoods. 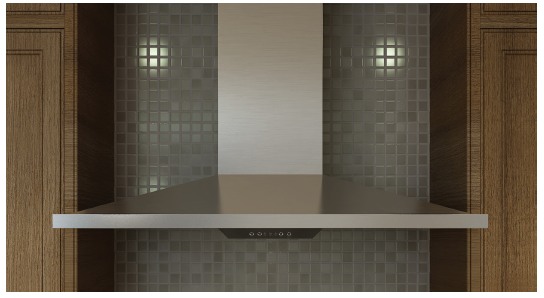 First, Yale hoods are unbranded and can be used with any brand and over any cooking surface from professional to simple electric. 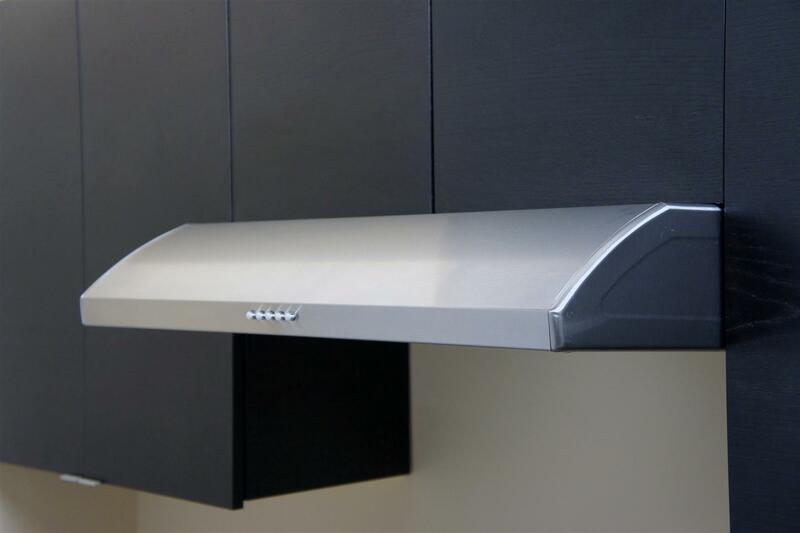 You can choose larger professional hoods for higher CFMs, decorative to be used as a focal point in your kitchen, or even blowers for your custom wood hood as well as under cabinet styles. What are available hood styles? The pro-style features baffle filters for better grease capture than regular mesh found in most hoods. It also has a powerful internal 1,100 CFM motor meaning it can move 1,100 cubes of air in just one minute. 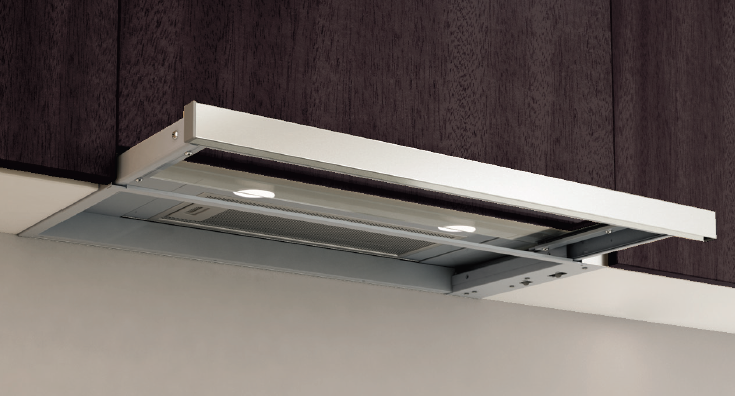 The professional can also vent from the top or through the back of the unit, rather than only through the top like most competing professional hoods for more venting flexibility. The professional hood is a bigger unit designed for higher output ranges or if you like to wok or stir fry. It is available in 30, 36 and 48-inch sizes. We have three different chimney styles with powerful 600 CFM. These hoods can also be recirculated if you can not run a vent out of your house. They are also make-up air compatible, so you can set the motor down to 290 or 390 CFM to comply with Massachusetts make-up air laws. 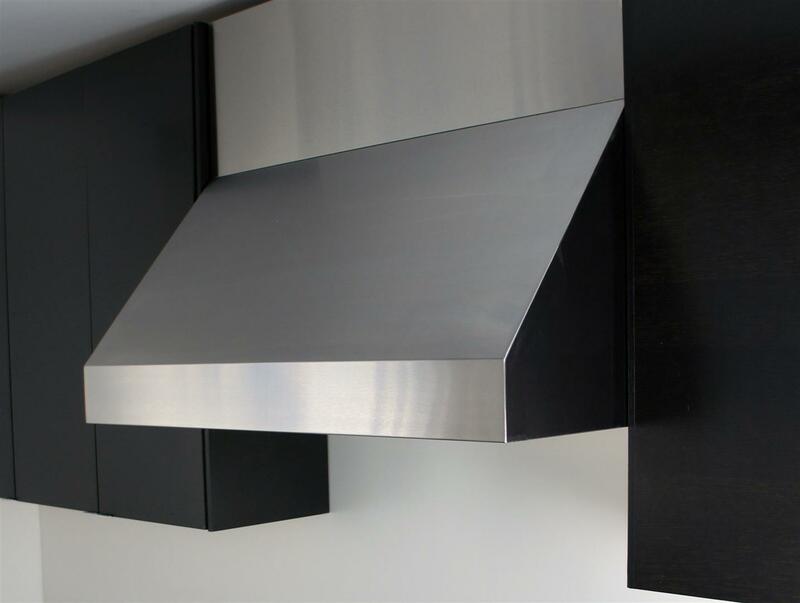 The chimney hoods are designed to be focal points in your kitchen but can handle some heavier cooking with a 600 CFM blower. They are available in 30 and 36-inch sizes. The hood insert blowers offer you the ability to customize with wood instead of stainless steel as an option for the decorative exterior. You have the ability to place it over most professional ranges with up to 1,000 CFM. Unlike most brands, certain models can be vented through the rear or top for more venting options. Like the Pro style, it has baffle filters for better grease capture. They have multiple sizes and liners to fit a customized wood exterior as well. The under cabinet units offer up to 600 CFM rather than the 210-400 CFM of many brands and can handle most types of cooking even in a smaller package. It is available with some of the professional type features like baffle filters as well. It is available in standard 30 and 36-inch sizes. So if you are looking for any type of vent for any situation, check out the Yale line for excellent output, multiple venting options, as well as classic style. Venting is very important especially if you like to cook. You do not want lingering odors and grease in your home. So if you have questions about hoods and how to vent, download our Yale Ventilation Buying Guide with advice on how to vent properly, advantages of an exterior, interior, and inline ducting as well as recommended CFMs for all the different ranges.